CARE is pleased to announce a total of $3.2 million in proposed Cycle 2 grant awards to 19 public and private entities; 16 of 20 projects are located in California and over 75 percent of grant funds are proposed for California-based projects. Combined, the grant-funded projects represent approximately 80 million new annual of PCC movement in California which includes: recycled output (Type 1 or PC4) and Tier 2 manufacturing pounds. The projects also represent roughly eight million new annual pounds in collected California PCC, along with 133 new California jobs. Grantees are now going through the contracting process before awards are final. Eight Cycle 2A Capital Improvement grants will support capital investment, infrastructure and/or equipment that will process or manufacture products utilizing California post-consumer carpet. Six Cycle 2B Product Testing and Development grants will support efforts to investigate the use of California PCC to manufacture established products, test or certify new or reformulated products, and/or feasibility studies on potential new uses of post-consumer carpet (PCC) materials. Six Cycle 2M Micro grants will support efforts to establish or improve reuse and collections operations in California. Each proposal was screened, evaluated, and scored by an independent Technical Committee of experts using the criteria set forth in CARE’s grant proposal solicitations under each award category. For a complete list of awards and grantees, see below. For more information, contact CARE Grants Manager Abbie Beane. See also the CARE grants page. Aquafil, Woodland CA, $250,000 initial and additional $250,000 when operational: The grant recipient proposes to use pelletizing equipment to recycle nylon into new carpet at its new Woodland, CA facility. Polypropylene and PC4 are designated for other Tier 2 products. ArrowStar, Dalton GA, $194,500: Grant funds would be used to convert PET post-consumer carpet to polyols for use in manufacturing urethanes used in floor underlayment, carpet backing and spray foam insulation. Circular Polymers, Lincoln CA, $500,000: This project proposes to use grant funds to expand Tier 1 processing capacity of proprietary RIS technology and a conveyance system which would expand product offerings among all fiber types and PC4 for Tier 2 products. Green Hive Group, Chico CA, $204,234: This company proposes to use grant funds for bagging technology for PC4 material for its spill cleanup project, marketed to small and large retailers and auto shops. Testing is also being done to prove recyclability of the product. Interface, Phoenix AZ, $160,021: Grant funds would be used to move additional Tier 2 tile processing and reuse capacity to California, creating one new California manufacturer. LA Fiber, Los Angeles CA, $500,000: Grant funds would be used for further Tier 1 processing capacity to purify PC4 and increase yield over 30 percent. This project would also reduce facility dust. SaN Pallets, Troy OH, $250,000: The project proposes to manufacture Tier 2 products, end caps and pallets, using PET, polypropylene and PC4 with polymer stamping technology. The manufacturer is exploring setting up a plant in California in 2019. Visions Environmental, Oroville CA, $260,360: Grant funds would be used to purchase equipment for Tier 2 manufacturing using PC4 in Double Green products. Products include blocks, car stops, fencing and aggregate. 3B Protection, Perris CA, $200,000: The project proposes to complete multi-stage testing of ballistic barriers using PC4 in this new Tier 2 application. CMJ Systems, Phoenix AZ, $198,700: Grant funds would be used to test and certify post-consumer reinforced concrete as an alternative to steel- or sand/gravel-reinforced concrete. ReFiber, Sacramento CA, $36,600: The grant proposes testing of fiber in water infiltration, septic and road reinforcement applications for use in the City and County of Sacramento. SwissTrax, Indio CA, $164,750: The project will complete testing and certification of post-consumer carpet in Tier 2 modular flooring tile products. Verdex Technologies, Richmond VA, $195,000: The project proposes testing and certifying post-consumer carpet PET in spinning nozzle technology to blend micro and large fibers into high margin nonwoven applications such as filters and acoustics. Visions Environmental, Oroville CA, $50,147: The project proposes to complete quality control and R&D testing of PC4 in stones, concrete and other new products. City of Berkeley, Berkeley CA, $14,000: The project plans to purchase a weather cover carport to keep PCC clean and dry year-round for a new collection site in Alameda County. City of LA, Los Angeles CA, $13,000: Grant funds would be used to lease a truck for 11.5 days to collect curbside PCC as a bulky item material from residential areas. This pilot pick-up service would provide data to inform similar programs. Global Material Services, Santa Rosa CA, $13,805.76: Grant funds would be used to purchase a weather cover to allow for 12 months of PCC collection, compared to 6 months of collection currently in Santa Rosa. San Joaquin County, North County Recycling Center and Sanitary Landfill and Lovelace Materials Recovery and Transfer Station, $14,063.98: The project would purchase two weather cover carports for two established CARE drop-off sites in San Joaquin County, allowing for year-round collection. Zanker Recycling, Florin Perkins, Sacramento CA, $15,000: Grant funds would be used to purchase five lids to retrofit containers used for collection from local retailers in the Sacramento area. Zanker Recycling, San Jose CA, $15,000: The project proposes to purchase a covered structure and pad for collection and weather protection of a new PCC drop-off site in Santa Clara County. How Is the California Carpet Assessment Used? 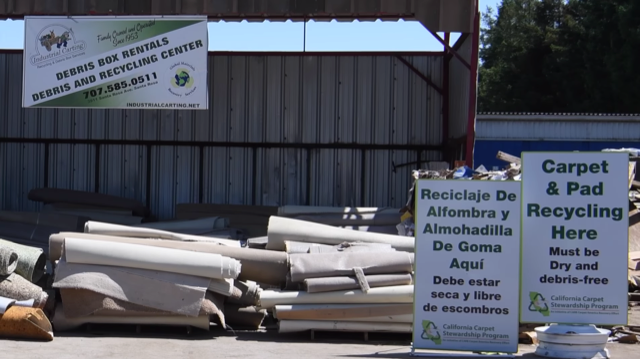 CARE administers the California Carpet Stewardship Program, which is charged with meeting the requirements for carpet recycling set by the California law AB 2398 (modified in 2017 by AB 1158) and managed by CalRecycle. AB 2398 is designed to find ways to incentivize the growth of carpet reclamation and recycling and still allow the market to work. The law generates funding to meet its stated goals through an assessment of 25 cents per square yard (increasing to 35 cents on January 1, 2019) of carpet sold in California. California consumers pay the assessment when they buy carpet. Those monies then support CARE’s efforts to increase carpet recycling in California. CARE’s goal is to have convenient sites where carpet is dropped off for recycling across the state. Convenient locations for recycling drop off/pick up for all California residents. Attaining a 24% recycled output rate by January 1, 2020. Over 85% of assessment funds collected support subsidies, grants, outreach and technical assistance. Ongoing subsidies to carpet recyclers and processors, in support of the carpet recycling industry and manufacturing of products made from recycled carpet The subsidies help support capital investments in recycling equipment, materials testing and product development — especially in light of the impacts from China’s National Sword on recycling markets overall. Grant funding — CARE has awarded $2.3 million to date for capital investment, product testing, market development and collection projects to establish and expand recycling of California post-consumer carpet. Approximately 90% of those funds were awarded to California-based projects. An additional $5 million in capital investment, new product testing, and collection projects is slated for 2018-19. Developing new California-generated post-consumer carpet (PCC) content products, expanding California processing and manufacturing capacity, and encouraging procurement of California PCC-content products by private and government entities. Expansion of the carpet drop-off site program, with a goal of establishing at least one site in every county in California. Continuing education/outreach efforts to carpet retailers, installers, manufacturers and consumers to encourage carpet recycling. In 2017, over 85% of assessment funds went directly to these program efforts, including subsidies, grants, marketing/outreach and the drop-off site program. As CARE’s efforts grow, so does the need for funding. Developing demand recycled post-consumer carpet is key to increasing the recycling rate. The California Carpet Stewardship Program is working to develop markets for recycled post-consumer carpet via grants, technical assistance and promotion. Post-consumer carpet is recycled into fiber material, plastic pellets and calcium carbonate-based filler, which are used in a broad range of products, including carpet, underlayment, commercial mats, insulation and more. Products containing California-sourced post-consumer carpet are high quality and competitively priced, and contribute to earning credits on LEED projects, among other environmental credentials. Our product catalog also contains information on other relevant product specifications. Developing and implementing Agreed Upon Procedures for carpet reuse. The Plan’s conditional approval means that CARE will continue as the carpet stewardship organization for California until further notice, and will work to meet the goals of legislation (AB 2398 and AB 1158) to reduce the amount of carpet going to landfill and to create a market for recycled carpet material. The approval also immediately releases grant funding for California-based recyclers. CalRecycle’s Request for Approval can be seen here. “This is great news,” said CARE Executive Director Robert Peoples. “Plan approval means we can continue to support the carpet recycling industry in California in order to keep more carpet out of landfill, create jobs and promote more products made with recycled carpet. We look forward to continuing subsidies to carpet recyclers, providing convenient carpet collection sites across the state, and educating retailers, installers, local government and consumers on the process and benefits of recycling. We will continue to work closely with CalRecycle to ensure that their conditions are met and that we meet or exceed the 24% carpet recycling rate goal by January 1, 2020. Like many textiles, carpet is made of petroleum-based material. Currently, more than 340 million pounds of used carpet are discarded in California landfills each year. Recovered carpet can be used to manufacture new carpet fiber, building and construction materials and products for the consumer and automotive industries, among other uses. The California Carpet Stewardship Program is funded by an assessment on all carpet sold in California. That assessment amount increases to $0.35 per square yard on January 1, 2019, up from the current $0.25 per square yard. Signed into law on September 30, 2010, AB 2398 was the first product stewardship law in the country to specifically address carpet. CARE was named the California Carpet Stewardship Organization in 2011. 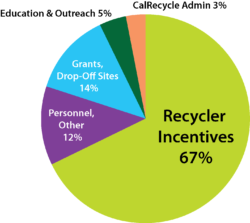 CARE’s California program provides subsidies and grants to recyclers to support collection, equipment and product testing, along with extensive installer and retailer outreach and consumer and local government education efforts. After five years of work on the Program, CARE submitted a second Five-Year Plan to CalRecycle in October 2016, with revised versions in March and August of this year. Carpet America Recovery Effort (CARE) is a non-profit organization dedicated to increasing the landfill diversion, reuse and recycling of post-consumer carpet through market-based solutions that benefit the economy as well as the environment. Since 2002, CARE has diverted more than 4.6 billion pounds of carpet from landfills in the United States, including over 500 million pounds from California landfills, promoted the use and development of products containing materials derived from carpet. CARE members include independent carpet recyclers, carpet manufacturers, dealers, retailers, suppliers and non-governmental organizations. Since 2011 the California Carpet Stewardship Program has been engaged with increasing carpet diversion and recycling and supporting new markets for recycled post-consumer carpet products in accordance with state law AB 2398. CARE has been the state’s designated Carpet Stewardship Organization since the law went into effect. October 3, 2018 — Sacramento, CA-The Carpet America Recovery Effort (CARE) has announced an updated assessment fee of 35 cents per square yard on all carpet sold or shipped in California, effective January 1, 2019. The rate is an increase from the previous assessment of 25 cents per square yard, set in January 2017. The assessment is collected by the retailer from the consumer, and is then remitted to CARE by way of the carpet manufacturers. The increase will be confirmed if the Program’s 2018-2022 Plan is approved by CalRecycle, which administers the California Carpet Stewardship Program, at their October 16, 2018 public meeting. Ongoing subsidies to carpet recyclers and processors, in support of the carpet recycling industry and manufacturing of products made from recycled carpet. The subsidies help support capital investments in recycling equipment, materials testing and product development – especially in light of the impacts from China’s National Sword on recycling markets overall. CARE has awarded $2.3 million in grant funding for capital investment, product testing and market development, and collections projects to establish and expand recycling of California post-consumer carpet. Approximately 90% of those funds were awarded to California-based projects. CARE has approved an additional $5 million in capital investment, new product testing, and collections projects for 2018-19. Expansion of the carpet public drop-off site program, with a goal of establishing at least one site in every county in California. Since July 1, 2011, all California carpet manufacturers and retailers have been required under carpet stewardship law AB 2398 to add an assessment fee onto all carpet sold in the state. The law is designed to increase landfill diversion and recycling of post-consumer carpet generated in California. 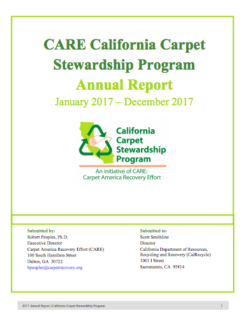 CARE administers the California Carpet Stewardship Program, which is charged with meeting the requirements for carpet recycling set by AB 2398 and new requirements under AB 1158 that went into effect January 2018. In 2017 alone, 98 million pounds of carpet was diverted from the California waste stream through the efforts of retailers, installers, manufacturers, recyclers and the California Carpet Stewardship Program. Since the program started in July 2011, CARE recyclers have kept more than 285,000,000 pounds of old carpet out of California landfills. The CARE website offers support and resources for retailers, including email notifications and a 30-minute informational webinar on the assessment on Thursday, November 8, at 1:00 p.m. PST. Register here. For more information, visit the CARE website. The recycled output rate (aka “recycling rate”) increased from 11% in 2016 to 14% in 2017, a 29% increase. Yield (percent of gross collections converted into recycled output) reached its highest level in 2017 at 48%, compared to a 5-year historical average of 34% from 2011-2016. Adding a suite of collector/sorter entrepreneur (CSE), Tier-1 processor, and Tier-2 manufacturer subsidies, and modifying others. Launching a new pilot Tier-2 nylon 6 subsidy of $0.10/lb. for recycled products made from Type 1 nylon 6 recycled output in October 2017. Expanding budgets for collection site support and outreach and education. Developing economic models for analyzing ‘what if’ scenarios: economic, financial, cost conversion. While several declining metrics are noted, overall Program progress is moving in a positive direction as recycled output pounds reached their highest levels since the Program began. Moving forward, the California Program will continue to partner with its stakeholders to find new ways to stimulate the industry in both the short and long term to increase collection, processing capacity and manufacturing presence in California, while promoting carpet recycling across the state. See the 2017 California Carpet Stewardship Program Annual Report.